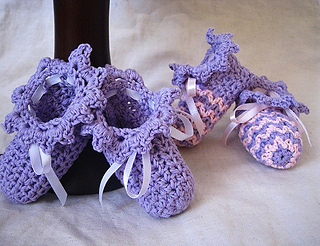 I love to make baby booties and hope you will enjoy my patterns. I offer you two versions of one pattern. You can make them striped or just in one colour. I made marks in pattern where you should change yarn to make them striped as you can see on the photo. This pattern will be good also for beginners, of course some crocheting skills are necessary, but it will be very easy to follow the pattern. For your convenience there is step by step description and many step by step photos. Pattern is made for size 0-6 months, but it is very easy to change size using different yarn, making couple of rounds more. 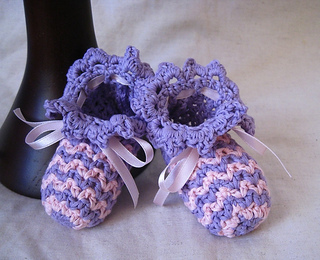 When you will make first pair of these booties you will understand how actually easy it is. Anyway I am always available for questions and if you can’t make size you need, contact me and I will help you!